In this post, I will present some interesting players from the Nigerian GLO Premier League 2013. At the time of writing, powerful striker Ifeanyi Ede has scored four goals during the Nigerian GLO Premier League 2013. Ede’s goalscoring record has never been eye-catching but most followers of Nigerian football will easily rate the strongman as one of the top strikers in the domestic league, primarily because of his aerial strenght, his healthy work-rate and his physical presence. Further, Ede has a lot of experience from the Nigerian league, from the CAF Champions League and from the various Nigerian national football teams. From my point of view, Ede is ready for an European adventure. John Aoundongu Huan, a skilful left-winger with tremendous speed, is back in Nigeria and top club Enyimba FC after 18 matches in the Albanian “Kategoria Superiore”. After the Nigeria Premier League 2010-2011, burly striker Adamu Mohammed was one of the hottest strikers in the league. His stints at Dolphins FC and Rangers International FC were rather uneventful and Mohammed has now joined high-flying Bayelsa United FC. On 24.08.2013, Mohammed scored his first goal for the Yenagoa-based club, his second goal of the season. Kingsley Sokari, the attacking midfielder of Enyimba FC, has been one of the revelations of the season. Sokari, brought directly from amateur football, has been described as a “wonder-boy” with “control, vision and ability to dictate play”. After a couple of months as a fringe player, making several positive substitute appearances, Sokari is now an established member of the first team. On 16.06.2013, Sokari scored his first top level goal, a beautiful free-kick against Heartland FC. 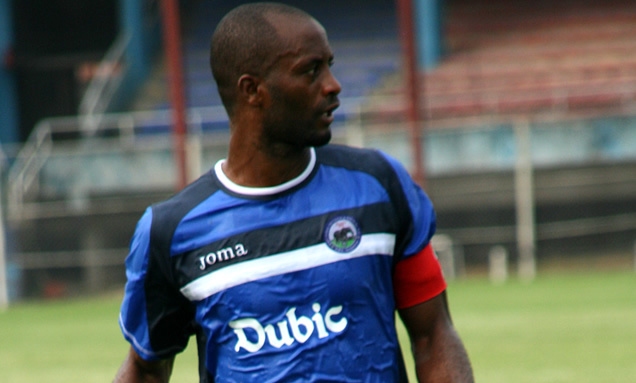 Chinedu Udoji is the captain of Enyimba FC. The towering centre-back is known for well-timed tackles, strenght, and excellent heading ability. Udoji is also remarkable consistent and widely considered as one of the best central defender in the GLO Premier League. In this interview, Udoji is described as “The perfect captain”: http://www.enyimbafc.net/news/news-detail.php?newsID=9#.UiJoIZLwkrU. The picture is of Udoji and was found on http://www.enyimbafc.net.